From the classic NS1000 through the ever-popular NS10M series, professionals worldwide have chosen Yamaha speakers for critical monitoring applications. Now the MSP5 and MSP10 powered monitors take Yamaha performance to new levels with state-of-the-art materials and design. High performance built-in bi-amplification allows for the best possible damping factor, tight controlled bass and fast transient response for accurate high frequency reproduction. The MSP5 is one of Yamaha's replacement models for the industry standard, now obsolete, NS10MS (although it is quite different). 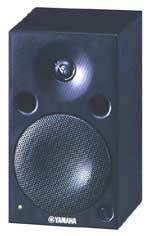 There is also a larger version called MSP10 and SW10 active sub bass and a smaller MSP3. Controls Master volume, low (4 position), high (3 position), power on/off switch.